Assistant to the Provincial Grand Principals Chris Butterfield was the pre-eminent guest at the installation meeting of Dalton-in-Furness Chapter No 6828. Pictured from left to right, are; Owen Osmotherley, Mort Richardson, Chris Butterfield, Peter Dismore, Gary Rogerson and Steve Murray. He was not the only distinguished companion in attendance as he was accompanied by his predecessor David Grainger and Christopher Band a Past Second Provincial Grand Principal. Fellow grand officers Rowly Saunders, Alan Jones and Barrie Crossley were also present as were Furness and South Lakeland Group representatives in the persons of vice chairman Gary Rogerson and secretary Alan Pattinson. Adding further lustre to the occasion were acting Provincial grand officers Andrew Bartlett, Tony Cassells and Peter Pemberton. Andrew and Peter had made their way from the Lancaster Group to support Chris. Proceedings were transferred to Barrow-in-Furness Masonic Hall from Dalton-in-Furness to accommodate the increased numbers which the installation meeting attracts. Pictured from left to right, are; Keith Templeton, David Ozanne, Kieron Mullan and David Baker. Outgoing first principal Owen Osmotherley installed Peter Dismore MBE as his successor in good style. Peter in turn installed Steve Murray as his replacement in the second principal’s chair. The ascent of Mort Richardson to the third principal’s chair was conducted by Steve. The three installing principals also had the responsibility of undertaking the robe and sceptre addresses. The trio are all new to their roles. The readings were delightfully orated by Keith Templeton, David Baker and David Ozanne. 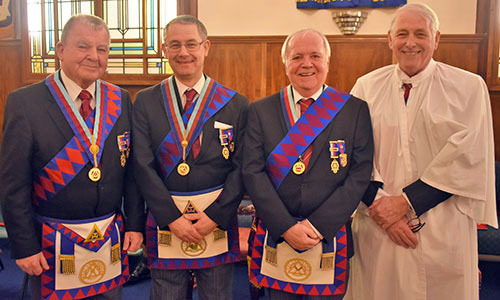 It was not the first time Owen had inducted Peter into an office, as he had also had the responsibility of installing him as WM of Dalton-in-Furness Lodge No 6828. To mark the occasion Chris was presented with two cheques. The first was in the sum of £500 for the Masonic Charitable Foundation 2021 Festival and the second for £150 in favour of the West Lancashire Freemasons’ Charity. The donation to the 2021 Festival meant that the chapter had qualified as a Patron of the MCF and the group charity steward Richard Wilcock was on hand to present Peter with a certificate confirming the achievement. During the evening Chris thanked Owen for not only his work on the evening but his efforts during his year of office when he had proved to be an excellent ambassador for the chapter. He also praised director of ceremonies Kieron Mullan who had stepped into the role as result of the untimely death of John Houlding at the turn of the year. Following the formalities a very agreeable three course meal was enjoyed in the Fairfield Suite. A raffle conducted during the meal raised £207 for the chapter charity account. Pictured from left to right, are; Peter Pemberton, Rowly Saunders, Chris Band, Alan Pattinson, Chris Butterfield, Mort Richardson, Peter Dismore, Steve Murray, David Grainger, Alan Jones, Tony Cassells and Andrew Bartlett.